We have just had our biannual trust meeting in Wellington and spent one day with invited stakeholders analyzing where we want to be in 10 years time. As a result we have tentatively made a small but significant change to the trust's name by replacing the word 'Dune' with 'Coastal'. This would make us the "Coastal Restoration Trust of New Zealand/Tāhuna ora". We are seeking feedback on this and would love to hear your opinion (email: info@dunestrust.org.nz). As the Coastal Dune Vegetation Network we were focused on growing fore dune plants. When we became the Dunes Trust we expanded to whole dune systems. So why "Coastal"? For me it gives a sense of authenticity to my involvement with the Trust because my local beach has gravel ridges, not dunes. It may give us opportunities to work on estuaries, rocky shores and hydrological systems. At the Wellington meeting we identified that we lack certain skills on the trust and we are looking for someone new to guide us in the promotion of the Trust and developing a communication strategy and relationships with sponsors. Do you know of someone? Are you that person? We wish to hear from you. The inaugural recipient of our Pingao & Toheroa Award, Alan Esler, passed away peacefully recently. Ross Duder from Piha CoastCare represented the trust at Alan's funeral and has provided a eulogy for this newsletter. Our planning for the 2017 conference is well underway (see Rodney’s article below). Book it in your diaries now and see you all there! Our 2017 conference will be held in Christchurch from 22 March – 26 March 2017. 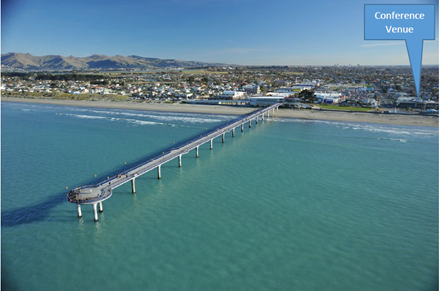 The theme for 2017 is “Diverse coastal environments in a time of change” and being based in Christchurch, it will show-case the wide variety of coastal landscapes in and around Christchurch/North Canterbury and the Banks Peninsula. It will discuss local and national issues and challenges faced in local and national coastal restoration and management. Registration for the conference will open shortly, so start planning a good time on the beaches of Christchurch in late summer. We aim to keep registration fees at a level that allows community groups, students, agency staff and other organisations to participate. This ensures a mix of ideas, skills and perspectives and enables all participants to build their knowledge and understanding about coastal restoration. Go here to keep an eye on information as it becomes available. We also offer individuals and businesses the opportunity to be a sponsor. Please contact Rodney Chambers on 027 226 7987 or rodney.chambers@ccc.govt.nz for enquiries or to discuss offers of assistance. 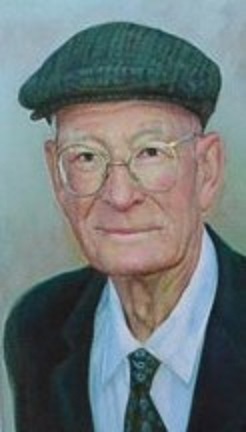 Alan died on 12 September after a life time of study, field research and teaching of botany, taxonomy and ecology of NZ flora. At his funeral in Mt Albert his sons, relatives and professional colleagues looked back on his passion for plants, ecology and the effect Alan had had on their lives. Alan's observation powers, his meticulous recording and his detailed sketches of plants were recalled with admiration. During the 20 years as a DSIR Botanist in Auckland he surveyed many plant communities and amassed his own regional plant collection, which he donated to the herbarium at the Auckland Museum. The culmination of his skills came in 2004 with the publication of "Wild Plants of Auckland", the story of 322 plant species and their communities that grow wild in Auckland's increasingly urban environment. Altogether he put out 150 publications, many of them in the NZ Journal of Botany. Amongst these were some early reports on surveys of sand dune colonies of the Manawatu and West Auckland. These pioneering dune ecology reports earnt him the title "NZ Father of Sand Dune Ecology". 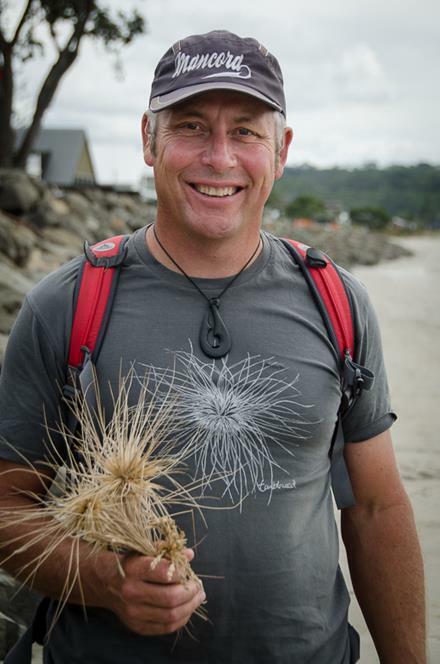 In 2015, in recognition of this work, Alan was the inaugural recipient of the 'Pingao & Toheroa Award' at the Dune Restoration Trust conference in Whitianga.This distinctive hand carved trophy depicts the curious relationship between the pingao sand binding plant and the toheroa life cycle. It was carved by Northland's dune and shellfish researcher and activist James Te Tuhi. I was fortunate to be able to attend Alan's funeral and offer a short tribute to his family and friends on behalf of the Trust. Predator Free New Zealand are committed to dramatically reducing NZ’s predator populations, including rats, stoats, possums, weasels and ferrets. To do this we need to understand what predator control work is being done already. New Zealand has the highest rate of threatened species in the world. Around 81% of our birds, 88% of our reptiles and 72% of our freshwater fish are endangered. Most of our native species are not found anywhere else in the world. Community groups, hapū/iwi and private landowners around the country are making a huge contribution to predator control. Unfortunately the scale of this work is not clearly understood. If you are involved in predator control in your coast care work, please add your efforts to the National Map. Thank you! Are you the kind of person....? The trust recently held a meeting with stakeholders to find out what is going well and what needs improvement. One of the outcomes was that we need a communication strategy and a marketing person. At this point in time there is no funding allocated to these. However there might be a possibility of payment for the right person. 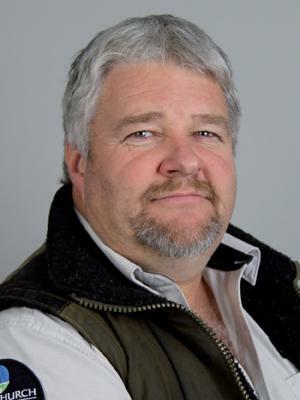 "I first met Rodney at our 2004 conference in Dunedin. He was then as now always ready with a smile and a friendly ear. He was a founding member of the Coastal Dune Vegetation Network (DT predecessor) and under his guidance Christchurch City dunes provide a living laboratory for pioneering dune restoration research with the challenges of the urban coastal squeeze. I acknowledge Rodney for his unwavering support for the trust and his insightful contributions to Dunes Trust business. He will be missed." Nominations for our Best Coastal Community Group and Best Coastal Dune Restoration Project Awards are now open for 2017. It takes team work and tenacity to start up and motivate people to work together for a common goal. Open to all volunteer community-based groups working in coastal areas, the Best Community Group Award recognises the efforts that go into successfully working together as a team. The award is generously sponsored by The Native Plant Nursery. The Best Coastal Dune Restoration Project Award recognises the ‘on the ground’ achievements of a coastal restoration project. The award is generously sponsored by Coastlands Plant Nursery. The Dunes Trust Postgraduate Student Study Award is now open for applications for 2017. This award provides funds to assist with an individual’s postgraduate level research to improve knowledge in the field of coastal dune restoration. The award grant is usually $2,000 plus expenses to travel and present at the Dunes Trust Conference. The information and application form can be found here. Applications must be received by 31 January 2017 and will be announced at next year's conference in Christchurch. "The South Georgian Diving Petrel (Pelecanoides georgicus; SGDP hereafter) is a burrow-breeding Procellariiformes with a circumpolar distribution across the southern oceans and is currently considered “Least Concern” by the IUCN. In New Zealand, however, the SGDP has declined steeply due to a combination of predation by introduced species and habitat destruction. Subsequently the species became extinct on the South Island, Stewart Island, Auckland Islands and Chatham Islands. The only remaining NZ breeding population persists in the dunes of Sealers Bay, Codfish Island (Whenua Hou), with a population size of 150 adults at most. Therefore, the species is considered "Threatened - Nationally Critical" by the NZ Threat Classification System. As this highly-threatened population is the only NZ Procellariiformes that specializes in breeding in coastal dunes, the Dunes Trust is supporting my research project aimed at better understanding the threats and population trends of the SGDP on Codfish Island." Johannes has just returned from his latest trip to Codfish Island and you can read his full update on our website here. There has been excellent progress during the last few months of mid-2016 in refining monitoring methods in consultation with community groups, iwi and management agency representatives. south of Whangarei with Northland Regional Council; and with Papamoa College and Bay of Plenty Regional Council. 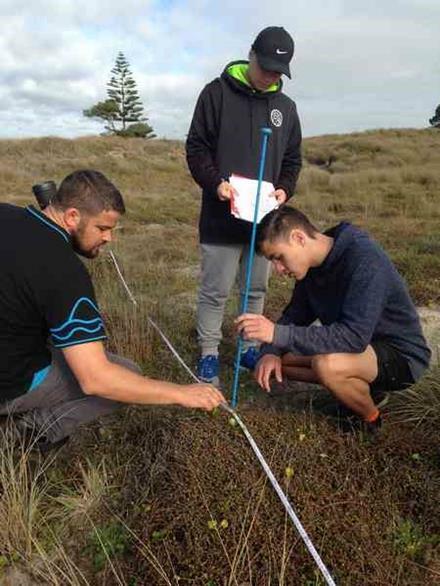 Transects from 10-80 m long have been established at each site representative of dune profiles, proximity to sea and vegetation cover from backdune to foredune zones comprising trees and shrubs to sand binding grasses and including both exotic and native flora. Sampling along transects comprises identification of the dominant plant species within a 20 cm diameter hoop at 1 m intervals along each transect demarcated by a tape. Data from each transect has been recorded for analysis for comparison across site. To read the whole story go here. The Dunes Trust has just completed the second year of a 3-year project aimed at developing guidelines for dune restoration at difficult sites. 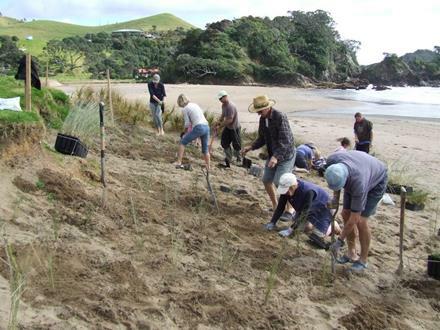 This project involves working with local communities and landowners in the Waikato Region to restore severely degraded coastal dunes at difficult sites on the east and west coasts. 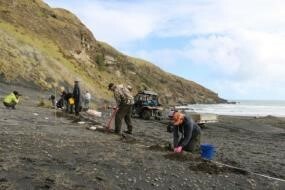 The project is funded by the Department of Conservation’s Community Fund in collaboration with Waikato Regional Council and local landowners and Beachcare groups. • Restoration of frontal and backdune environments on two severely degraded dunes on difficult, exposed, high energy dynamic west coast sites. • Restoration of two severely degraded weed-dominated backdune sites on the east coast. • Production of best practice guidelines for restoration of difficult sites based on the projects and other experience around New Zealand. To read the full update go here. If you travel for business or pleasure please consider using www.kiwikarma.co.nz. At no extra cost to you, Kiwi Karma donates 5-8% of the room rate to your favourite charity and you can choose to give it to us! They are also running a great competition where you could win a trip to California worth over $10,000. Enter here. Not long to go before summer comes, though we may have to put up with spring's changeable weather for a little while longer. 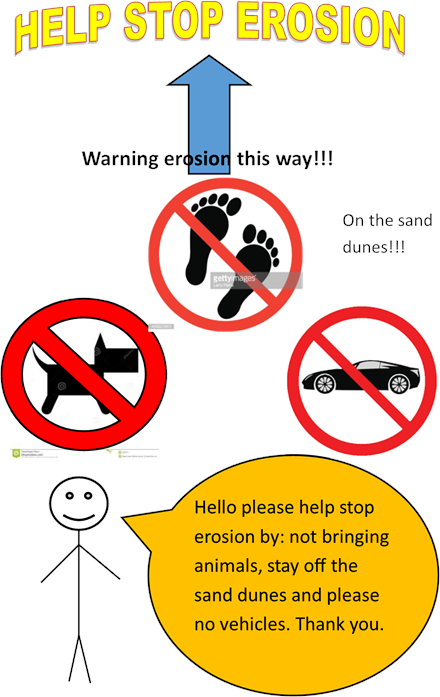 Please remember to keep your vehicles off the dunes, visit some nice ones and enjoy the warm weather! This picture was found on the internet. Nice and colourful I thought. Maybe we could add a NO BUNNIES picture too. Will they obey? Wishing you all a happy summer and relaxing holidays!